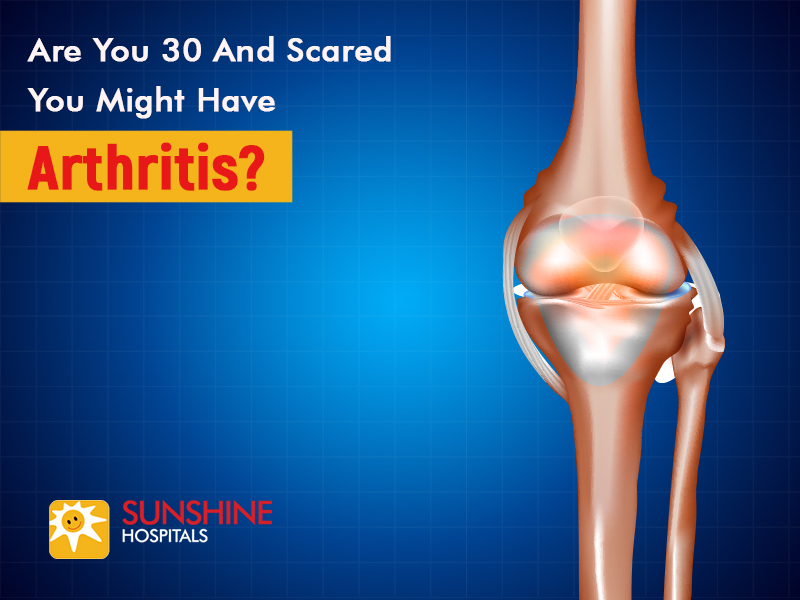 Are You 30 And Scared You Might Have Arthritis? Read To Find Out! Time is an enemy of your body if not taken care of properly. Every year you become a year older and just when you become a year older, your body and each part of it becomes a year older too. Now it depends on how your lifestyle, your activities, the food you eat and what you drink to know if your body is ageing faster than you are. In a lifestyle that people usually lead today, where there is seldom any regard for health, 30’s have become the new 50’s. Many diseases and conditions which were considered to happen during ‘old age’ can be seen in young adults between late 20’s to late 30’s. Now, why is this happening? Are you one of the people experiencing conditions which you thought would not affect you at all or even if it did, would affect you in your 50’s? One of the most common conditions affecting people at an early age is Arthritis. The condition of arthritis is inflammation of one or more bone joints in the body. It mainly causes stiffness in the joints along with pain which gets worse with time. When it affects your knee, the cartilage which acts as a natural cushion between your bones gets damaged due to excessive wear and tear. This results in the bones constantly rubbing more closely against one another resulting in pain, stiffness and swelling. Usually, this condition affects the elderly but nowadays, there is an alarming rate of increase in the case of arthritis in the knee for young adults as well. Why is this happening? Are you one of them? Your knee is one of the most important joints in your body. It connects the whole of your upper body to your legs which results in mobility and movement. You are able to walk, run and do all sorts of activities because of your knee joint. Now imagine your knee joint is inflamed and causes pain while indulging in the most basic of movements. Hurts right? Pain during any kind of movement but decreases with rest. Stiffness in the knee, especially when you wake up in the morning or long periods of rest or no movement. Creaky or crackling sound when the knee moves. The most common cause of arthritis in the knee is age. Or was. Nowadays, there are various other factors at play apart from age. Weight: People who are overweight or obese are more likely to suffer from arthritis. More the weight, more the friction and pressure on your knee joints. The whole weight of your body falls on your knee joints. Genetics: Hereditary factors also play an important role in a person developing this condition. If someone in your immediate family has arthritis, it is more likely that you will develop the same. Gender: According to statistics, women who are above the age of 55 are more likely to develop arthritis than men of the same age. Injuries: Repetitive injuries on your knee or joints, such as fractures in the same area often can lead up to wear and tear of the cartilage ultimately leading to arthritis. How Is Arthritis Of The Knee Treated? Firstly and most importantly, if you think you have the symptoms similar to the ones mentioned before, visit your doctor to know more in detail and get adequate tests done. If you do not have a doctor, visit us or book an appointment at Sunshine Hospitals and we and our doctors will be more than happy to help you and treat your condition if any. Weight Loss: Losing weight even if its a few kilos can help with the pain arising from arthritis. Exercise: Knee strengthening exercises can give more stability to the knee and also reduces pain. Along with this, stretching exercises make the knee more flexible. Pain relievers: Any kind of anti-inflammatory drugs and pain relievers are often prescribed by the doctor to reduce the pain experienced due to arthritis. Steroids: This is done if and only if it is prescribed by your doctor. Steroids are very effective anti-inflammatory drugs. Physical therapy: Therapy is one of the most useful treatments for any kind of arthritis and especially in the knee. If you can learn physical exercises from trained therapists and apply it everyday, physical activities on a day to day basis becomes easier and often pain-free to a great extent. Surgery: When none of these treatments works, surgery is the last option. It is said, that before the age of 65, surgery for knee arthritis should not be done. Even though you have read the symptoms, causes and treatments for knee arthritis, if you feel the slightest of pain in your knee, do not waste time by speculating, visit us at Sunshine Hospitals, and we will make sure to provide you with the right kind of treatment which will coincide with your daily activities and not only free you of the pain but also make your life easier. Dr A.B Suhas Masilamani is one of the surgeons who has trained in the USA and has come to work in India, He finished his MBBS and MS Orthopaedic training from Christian Medical College, Ludhiana. He then went on to clear his DNB Orthopaedics, pursuing fellowship training in the United States later. His first fellowship was in Paediatric Orthopaedics at Montefiore Medical Centre, Albert Einstein School of Medicine, New York, USA. This was followed by a second fellowship in Adult Hip and knee joint replacement Surgery at Bronx Lebanon Hospital, Icahn School of Medicine at Mount Sinai, New York, USA. He is one of the very few surgeons from the city to become a member of the American Academy of Hip and Knee Surgeons (AAHKS). He is also a member of the American Academy of Orthopaedic Surgeons (AAOS) and International Congress for Joint Replacement (ICJR).